Reviewer says: "Don't waste your money on it"
WHEN people say crazy things like: "I'm going to write a book on my phone" they generally don't mean it. Georgina Campbell, apparently, meant it. 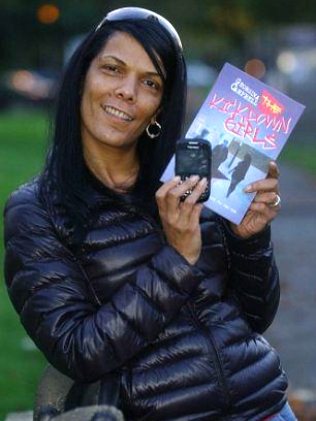 The British mum penned all 55,600 words of The Kickdown Girls on her Blackberry - and scored a book deal in the process. Ms Campbell was watching a movie called Attack The Block when she claimed she could write a better script. Her daughter challenged her to prove it. She did. OK, so she wrote a book instead of film script, but we're going to let that slide. The book took four months to write. That's persistence. But persistence doesn't necessarily guarantee quality, at least according to one angry Amazonc.o.uk customer. "I could barely finish the first chapter. Appalling grammar, crudely written it's almost in text-speak. It reads as if written by a child," wrote AvidReader. "I don't even want to give it 1 star but I have to, to complete this review. Don't waste your money on it." Harsh. We've not yet perused the tome but we give this five stars for effort.